I quickly sent off a response: "Infrastructure; You don't need cycling culture. Citizens choose transport mode that works. Infrastructure tilts balance 2 bike". Cycle Ontario responded: " but would the culture not create the need for the infrastructure thus making the political decision easier"? Here we have it the classic chicken and egg dilemma. If we build cycling infrastructure will cyclists appear, out of nowhere to use it? Making the case for cycling infrastructure self evident. Unfortunately, it takes huge political effort to get even the most basic infrastructure built. 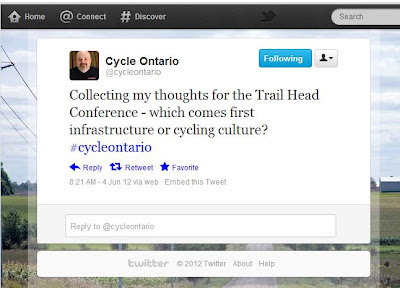 Once built, as we've seen in Toronto, cycling infrastructure remains vulnerable to political fashion and whim. Wouldn't a vibrant cycling culture make the political heavy lifting easier? A vibrant cycling culture might be able to mobilize votes, or exert political pressure through lobbying. 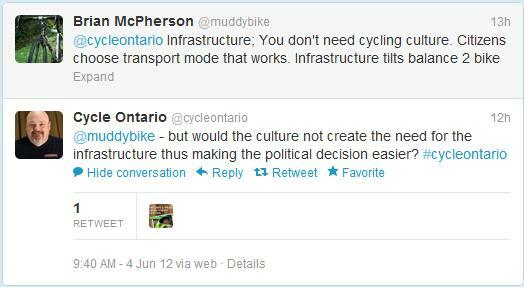 Votes and lobbying are the fuel of the political process, and probably not something "cycling culture" can deliver. I am not sure there is a "Cycling Culture" as a single thing that can be harnessed or mobilized. As Mikael Colville-Andersen of Copenhagenize states in the tongue in cheek, 18 Ways to Know That You Have Bicycle Culture. You likely have a vibrant bicycle culture if you never think of bicycle culture, and just ride your bike. If you focus on culture first, you're getting the <1% "strong and fearless" to convince "enthused and confident" 7%, and ignoring the 60% of "interested but concerned". I see a very big problem counting on such a small group to do any political heavy lifting. When you deal with the reality that this small group is split into several "cultures". Ottawa's cycling community supports the Responsible Cycling Coalition and Cycling Vision Ottawa. The former group is solidly against infrastructure believing, sincerely, that cycling infrastructure is a threat to cycling. The later group advocating strenuously for cycling infrastructure. If you are counting on "cycling culture" to deliver infrastructure, you had better get the right one. Private automobiles are a convince, there is no reason to prioritize them as well. The answer is not cycling infrastructure in isolation but in combination with a public transit and walking strategy that returns the city to a more human scale.